Although some wrongfully attempt to deny its existence, the Holocaust is an especially dark moment in human history that many of us are unwilling to forget happened. So much has been made of its inhumanity and complete disregard for life that to add anything further would be unnecessary, with countless books, films, programmes and more going into far more detail about the sheer atrocities that went on in those concentration camps than we ever could. 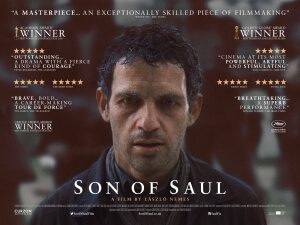 Son of Saul, however, introduces an interesting angle that adds a further layer of humanity on top of everything else, and though it’s far from the first film of its kind to introduce something like that, it all adds up to something that is not only a heart-wrenching account of life within the walls of Auschwitz, but also something that feels extraordinarily personal from start to finish. Recently bestowed the Academy Award for Best Foreign Language Film, the Hungarian-native film follows the Sonderkommando – a group of death camp prisoners forced to assist the Nazis with the disposal of several bodies following their entry into the gas chambers – and in particular one such worker named Saul (Géza Röhrig), who one day comes across the body of a young boy he believes to be his son. Determined to salvage the body and give his son a proper burial, Saul resolves to find a Rabbi amongst the several prisoners who can perform the Kaddish as he lays him to rest, all the while manoeuvring around an increasingly heated discussion and planning of a rebellion against their captors. That rebellion turns out to be the least of Saul’s worries, as it is made clear on more than one occasion that the most important thing to him is giving his son the respect he feels he deserves. For him, it’s a personal crusade that just so happens to be running parallel to something that’s much bigger and, in the grander scheme of things, more important than what he’s attempting to do. Yet, director László Nemes – making his feature debut with this film, and what a debut – has us stay with Saul all the way through, quite literally in fact; from the very first shot of the film onwards, the camera almost never leaves his side, so wherever he goes we go, from the gas chambers where he searches for papers and jewellery in dead prisoners’ clothes, to the hellish bowels of the crematoriums where he must shovel endless piles of ash and coal into the flames. Nemes has also chosen to frame the film with the 1.37:1 Academy Ratio (click here if you’re not sure what that is), which compresses our perspective of things from his point of view even more tightly, forcing us even more to bear witness to some of the horrific trials and tribulations he ends up going through, such as almost being burned in the woods or, in one particularly saddening scene, be the subject of ridicule by a Nazi officer who forces him to participate in a mockery of the Jewish dance. It can make the film extremely uncomfortable to watch, though given the subject matter this is very much intentional, and through such tight and powerful cinematography Nemes has cracked a very unique perspective on such a horrific time in history that not many others have really able to accomplish. Those looking for a much deeper narrative or even rounded characters in a film that re-enacts such terrible crimes against humanity won’t necessarily find much here – a lot of the plot, even Saul’s own crusade, just comes and goes, and many of the characters are not given a lot of depth, with even Saul himself being more of an observational character rather than an actual compelling lead – but in the end, none of that really matters. Son of Saul is the kind of movie that wants to give its paying audience a sensory experience of just being in the situation that Saul and his fellow prisoners are in, and like some of the most powerful films about the Holocaust you only need to watch it once without especially feeling the desire for a repeat viewing. After all, one helping of human tragedy at a time is more than enough for anybody. Son of Saul is a powerfully intense piece of Holocaust cinema that takes a fairly unique approach to displaying the horrendous life behind the walls of Auschwitz, with director László Nemes incorporating tight cinematography and a fly-on-the-shoulder vantage point that forces us to experience its inhumanities head-on, without compromising any of its evils to a point where a second viewing is not necessarily required.